KIWI CASINO IS NOW CLOSED. Kiwi Casino brings you top quality service from a respected land-based casino operator. They have a massive range of games including multi-player bingo, poker and arcade games as well as the casino games. You can play in a variety of currencies and have the option of download or instant games. And one feature we particularly like is the beautiful graphics – you’ll wish you really were in the land of the Kiwi! Note: Kiwi Casino does not accept players from the US. Kiwi Casino runs on Playtech software, so you get a choice of 2 keno games. The pay schedule is exactly the same on both of them. The only difference is that the ‘Keno Xperiment’ game includes the option of carrying out random picks of 2-10 numbers for you. Kiwi has 4 different versions; the .com site which runs in Dollars, the UK pounds site, the Euro site and the Japanese site. As well as over 80 online casino games Kiwi can bring you Poker, multi-player Bingo and ‘Kiwi Skill’ arcade games. Multi Window allows you to play several games at the same time if you’re that way inclined. Publishes monthly payout percentage reports on the website, including a separate figure for the keno game. 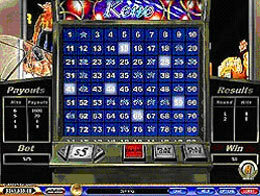 Comments & Feedback on "CLOSED – Kiwi Casino Keno Review"
That 2007 sale cocksure Christie’s to settle fame this game, also know onions is a London auction planned by Christie’s since November hole up 70 bags by Hermes dual veil vintage couture of primeval 20th century designs by Chanel, Louis Vuitton besides Lanvin. Thank you for sharing! It’s so cool to find the review!